Our newest addition to the series verifies the not-so-old-adage that the best camera is the one with you. Because of the shocking number of Alabama kitty sightings, I now regularly include the street in my regular walking route, looking for more. Few days back, as dusk settled into night, I barely made out a white cat with orange markings sitting in a yard; photo wanted. But as I approached the fence, a dog barked from inside the house. There really wasn’t enough light to use iPhone X, anyway, so I gave up. Twice yesterday, I walked by the property, hoping to see the beastie again. On the second go, the furball approached from the cross street strutting quickly down the sidewalk my way. Paying no attention to me, the kitty scooted into a yard. By the time I came up to the corner of the fence, iPhone X already out and camera app open, the cat had reached the house and started climbing up the side of the building to a window ledge—or so it seemed. I wrongly assumed that the meowing feline asked to be let in. Failing to understand what was transpiring, I missed the perfect shot—or series of them. Nevertheless I got something memorable, because of the smartphone’s camera. I snapped the shutter just as the kitty climbed atop the fan and inside the window. Because Apple’s Live Photo feature captures mutliple frames—and lets you select the primary view—I could review other moments of the shorthair climbing the fan. But those stills are blurry, unfortunately. Hehe, in response to hearing the scenario described, stealthily entering an open window, my wife asked: “Is this where cat burglar comes from?” Hence the animal’s nickname. In a way, I am not surprised to see the setup that lets the putty-tat come and go freely. 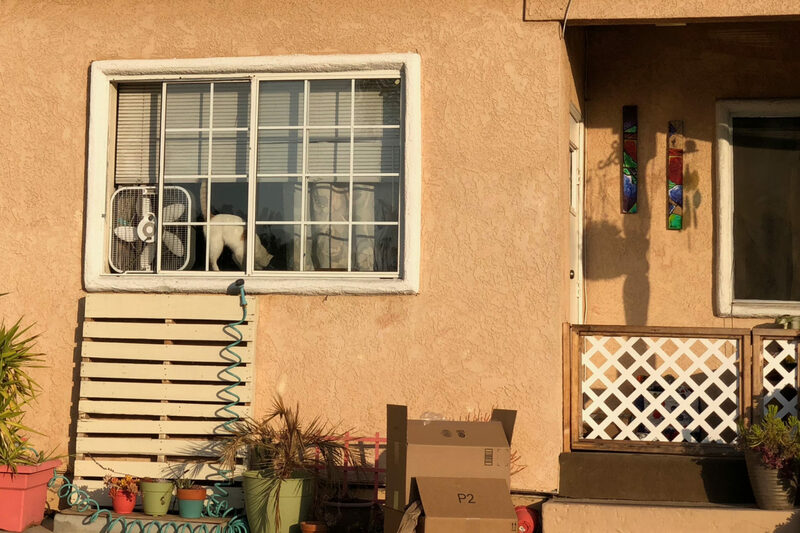 In neighborhoods with more single-family homes, residents with cats often leave garage doors slightly lifted so that their kitties can go outside during the day. Burglar is the first in another trio of new felines photographed along Alabama. I have encountered nowhere near as many on any one street in the neighborhood. Other than perhaps a larger number of mutli-unit dwellings (e.g., denser population means more potential pet owners), I can fathom no reason why. 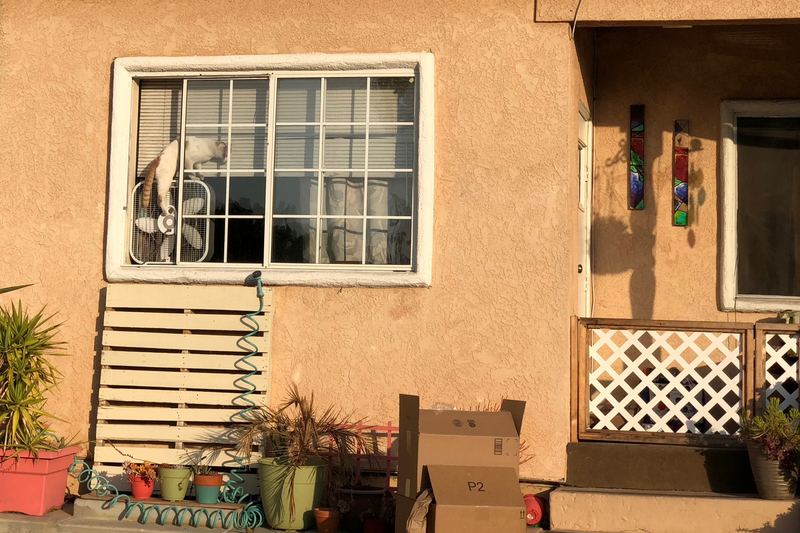 That Alabama is not a through driving street from either side of El Cajon Blvd.—and is removed from coyote canyons—could contribute by ensuring felines residing there live longer. Other veterans of the street: Bella, Goldie, Itchy Valentino, Mr. Kitty, Monkey, Nine, Smokey, and Willow. Amanda joins the list. I first saw her on Meade near Alabama, but we met again Dec. 8, 2017 as she lounged on the steps of an Alabama apartment complex. Spry earns inclusion for having been sighted in the alley behind the street. That’s 10 cats I know of, and today the first of three more join them. For the privacy and security of Burglar’s owners, I won’t reveal the cross street, and the house number has been removed. Vitals for the Featured Image and its companion: f/2.4, ISO 16, 1/1372, 6mm; 3:34 p.m. PST. Meow, meow: Scruffy, Roly Poly, Woo, Skull, Biscuit, The Colonel, White, Chipper, Frisky, Stretch, Needy, Farfisa, Mates, Hunter, Pee-Pee, Blue, Blue Too, Bonded Pair, Patience, Fess, Jumper, Frenemy, Looker, Cozy, Scout, Lurks, Skit, Mini, Betty, Black and White, Stalker, Bell, Chill, Sammy, Scratch, Poser, Star, Grey and White, Watcher, Herman, Comet, Roman, Willow, Chub, Nimbus, Watson, Lilo, Kit, Pepe, Twilight, Sebastian, Spot, Booger, Ash, Veruca, Riley, Mellow, Bonde, Flower, Glass, Black, BeBe, Fang, Bruce, Siamese, Pounce, Tortie, Haiku, Fraidy, Peso, Daniel Tiger, Dusk, Stride, Dainty, Spry, Tabby, Betty Too, Still, Levi, Shadow, Sophie, Wink, Ferals, Momma, Charlie, Tux, Cool, Benny, Jellicle, Itchy Valentino, Goldie, Nine, Amanda, Siesta, ChaCho, Charlie, Too, Mika, Crystal, Seeker, Mittens, Dancer, Smokey, Monkey, Captain Blackbeard, Season, Maven, Tink, Chunk, Curious, Hanoi, Bella, Tarry, Guido, Maxine, Mr. Kitty, Peohe, Panda, Frankie, Sunshine, Twain, Willow, Too, Brawn, and Reddy.